New: The extent of sea ice in the Bering Sea has dropped lower than it has been since written records began in 1850! The Future of Sailing - In most parts of the world, people lament the decline in enthusiasm for sailing. And yes, we do see so very, very many boats that never seem to leave the harbor. We have heard many tales of youth sailing programs that have serious rates of attrition from one year to another. What can one do about this? There's something curious about sailing and being on the water. It's not always that just any music will do. Sometimes you have to hear that soothing rhythm that reflects a soul borne on the water. A selection of our favorited with additions from our readers. Do you want to listen to Tradewinds Radio while browsing? Happy Hooking is a very readable book loaded with valuable information on anchoring tackle, anchoring technique, tying up and rafting, anchoring etiquette, as well as the occasional anecdote - simply stated a must have! To read reviews by the Ocean Cruising Club, the Cruising Club of America and other impressive bodies, please click here. White Seahorse Publishing Announces the Launch of its Classics imprint. Co-Branded Books - a great marketing tool! There are few things more valuable to know about when selecting an anchorage in many parts of the world, especially if you are a sailor with a deep draft vessel, than the tides and currents. This section is devoted to things you can do yourself to maintain or upgrade your boat, saving yourself money, and often aggravation. Weather: for links to all the information. New: Let us enlighten you about LED lighting! Potential interference of VHF-FM Radio and AIS Reception. Cruising Rallies... what is it that leads some boats to succeed and others to fail? None of us can cross oceans with any guarantees. But the choices we make can have a big impact on the results. For the adventurous at heart, the wanderer, trailblazer, or artist, the west of Ireland is the place to go, see, and experience life. Bring some time and stay a while, you will never regret it – guaranteed. Whether by land or by sea, visiting Wild Atlantic Way along the coastline of the west of Ireland will reconnect you with nature and with your inner self. Lock Safety - Learn how to open the gates, the importance of staying forward of the cill, as well as how to safety empty the water from the lock. Cruising Ireland - Having crossed the pond three times, we are currently based in the west of Ireland! This is perhaps the nicest cruising we have done to date, and we just had to share. Additions, corrections and updates are always welcome! Please visit our Homeport Pages for information about advertising opportunities. 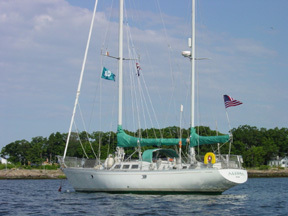 CoastalBoating.net is dedicated to the joy of coastal boating, coastal sailing, coastal cruising, and coastal racing. The primary objective of this site is to empower sailors and those who would like to be sailors to go out and enjoy their sport and passtime - to enjoy boating in whatever form it takes for the sake of boating. Coastal Boating provides the best all around experience for boaters who would like a local resource guide that also covers local news, including race results, and seamanship skills. It is not intended to prepare people for the great offshore experience: there are plenty of resources out there for that. It is for all of the rest of us who may dream about a big adventure yet find ourselves perfectly content, if not driven, to experience the waters in our own territory to the fullest. Please be aware that boating, as most other water sports, can be dangerous. You should not attempt it without first receiving competent instruction. Coastal Boating and Knowledge Clinic Limited will not accept any liability whatsoever related to content on our website.